This was a film I found myself really enjoying watching. It was good to see that, although this film was primarily a comedy, there were some really good action scenes in this as well. I found Susan to be a really likable character. There were times I felt really sorry for her, but it was really cool to see her try to make the best of the bad situations. And it was also good to see there were quite a few surprises about her through this film. I liked seeing Susan’s interactions with the other characters in this. Some of her exchanges with Nancy really made me laugh. It was also really interesting to see the different kinds of gadgets she was given… even if the disguises were somewhat disturbing. I thought it was really good to see that, although this movie was a comedy, Susan was actually really capable… even if she did vomit and faint a couple of times when she was forced to defend herself. 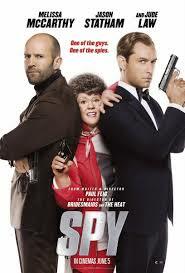 I liked both Jude Law and Jason Statham in this movie… even though I didn’t really see Jason Statham as a comedy actor. There were still some amusing scenes with him in, though. What I found interesting was that a lot of what his character was saying seemed to link to other roles he’d played. I’m not sure if that was deliberate or not. It was also amusing to see the disguises that Susan had to take on. There were a few unexpected moments in this movie… although there was one particular thing I did see coming. Seeing Susan’s and Ford’s interactions were amusing… though Aldo made me cringe whenever he cropped up. Even if he was technically capable. There was quite a bit of violence in this movie… as well as sexual references and some very cringe-worthy scenes. It definitely deserved its 15-rating, but I did find it a really entertaining movie to watch. Some bits were a little over-the-top, but I was drawn in and I was rooting for Susan, which is always important when it comes to the main character/s. There was a final scene, so I would suggest staying through. I think this film is worth watching, despite the sometimes-crude moments of humour.